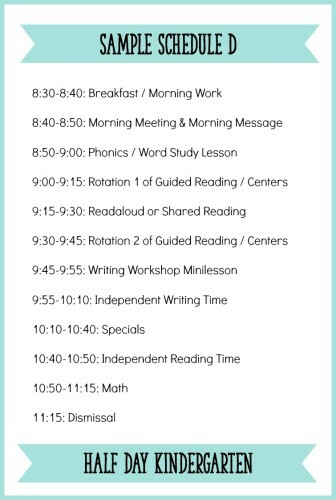 Building a balanced literacy block for Kindergarten was always one of the most challenging parts of creating my daily schedule. There was SO much I wanted to fit in – and that was especially true when I co-taught in a half-day Kindergarten classroom! 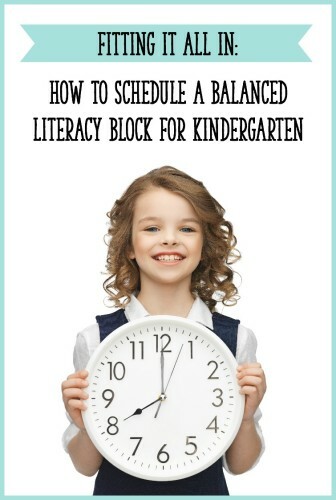 Whether you teach full day or half day Kindergarten, creating a schedule with a balanced literacy block can be tricky. Keep reading to see the components of my Kindergarten literacy block, how long we spent on each component, and some sample schedules for full-day and half-day Kindergarten. 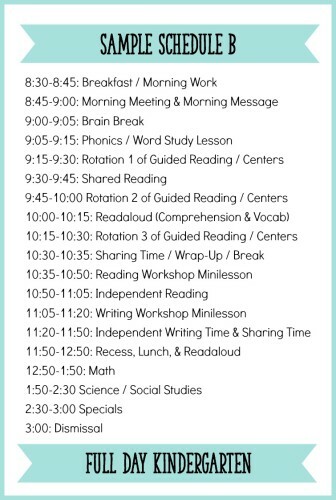 Readaloud (10-15 minutes): If I can swing it, I actually do a readaloud twice a day: one time, we read a book for pure enjoyment, and another time, we read a book to focus on comprehension strategies and vocabulary. You might choose to focus on comprehension and vocabulary during your literacy block readaloud. Then, you could do a readaloud for enjoyment after lunch or recess. You don’t necessarily need 2 brand new books for each day, however. For example, you could read aloud a book for enjoyment on Monday after lunch. Then, you dive into that same book more deeply on Tuesday during your literacy block. I’ve found that kids can better focus on practicing comprehension strategies when they’ve already listened to the book previously. If you don’t have time for two readalouds in a day, you might focus on comprehension Monday, Wednesday, and Friday, and read just for enjoyment on Tuesday and Thursday. Shared Reading (10-15 minutes): This is when I read aloud (and have students help me read) a big book or one of the projectable books from Reading A to Z. Students sit on the rug so that they can see the print. We typically read only 1 or 2 books per week, because we read each text multiple times (first time for comprehension and enjoyment, and additional times for teaching points like “Look at the first letter of the word”). At the beginning of the year, I use shared reading to teach concepts about print (directionality, concept of word, punctuation, etc.). As the year goes on, I focus more on decoding strategies and fluency. Guided Reading and Centers (45 minutes – less at the beginning of the year): During this block of time, I meet with students for guided reading while the other students work independently (as much as Kinders can be independent!!). In guided reading at the very beginning of the year, we work on simple tasks like learning the letter sounds, but I try to get them reading emergent books as soon as possible (get the lessons I use HERE). The students who are not meeting with me work in literacy centers. At least one of the center activities provides students with further practice on the phonics skill taught during the day’s phonics / word study lesson. Later on in the year, I differentiate that center to give students practice with phonics skills that are more appropriate for their current skill levels. I usually incorporate a picture or word sort from Words Their Way. 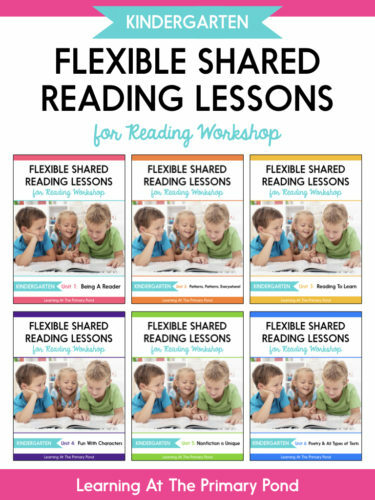 Reading Workshop Minilesson (10 minutes): I teach a decoding, fluency, or comprehension skill (just one per lesson) that students can practice in their independent reading. This is a very brief, focused lesson and can be combined with shared reading. Independent Reading (20 minutes +5 for sharing time): Students read independently (not silently, but whisper reading). You can also incorporate independent reading time into your literacy centers, but I’ve found that kids are more focused when the classroom is quiet and everyone is focused on independent reading at the same time. I confer with kids individually while everyone is reading. After independent reading time, we come back together as a group so the kids can share about their reading and strategy use with a partner or the class. Writing Workshop Minilesson (10 minutes): I teach a brief, focused lesson on a writing skill that students can use in their own writing. I structure my writing units by genre, so whatever skill I’m teaching is related to that genre. I model real writing during almost every one of these minilessons. Phonics / Word Work Lesson (5-10 minutes): I teach a quick, whole group phonics lesson on a letter, word family, or other spelling pattern. As the year goes on, we move to a small group setting. 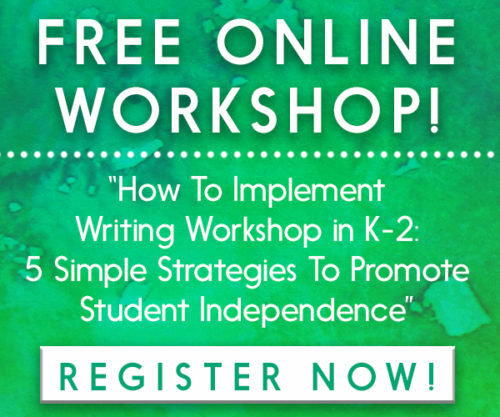 For a free yearlong guide to teaching phonics in Kindergarten, click HERE! Phonological Awareness (5-10 minutes spread out throughout the day): This is when we do quick, oral activities to increase students’ awareness of the sounds in words. Phonological awareness activities can include rhyming, segmenting words into their individual sounds (cat -> /c/ /a/ /t/), blending individual sounds to make words, substituting sounds, clapping syllables, etc. I don’t usually write phonological awareness into my daily schedule because we do these activities during transition times and small group/guided reading. Morning Message (10 minutes): I didn’t include morning message in the list above, but I also use this routine to teach literacy each day. Before the kids arrive in the morning, I write a sentence or two to start the message. We read those sentences as shared reading (you can quickly teach decoding skills, concepts of print, and phonics – just choose one teaching point per message). Then, I tell the kids that I want to add on another sentence, and we write it together as interactive writing. If you teach half-day Kindergarten, kudos to you! Seriously. Trying to cram everything into a couple of hours is such a challenge. Although my students were always tired at the end of full-day Kindergarten, I would much rather deal with that than have only a few hours to get everything in. Placed the readaloud and shared reading in a single time slot – you could do a readaloud on Mondays, Wednesdays, and Fridays, and then do some sort of shared reading on Tuesdays and Thursdays. Either way, you’re still reading to the kids – your focus would just shift depending upon whether it was a readaloud or shared reading. Allowed very little time for science / social studies. You can absolutely still teach science and social studies, but you will need to integrate the content into your literacy block. You can create units of study about a content area topic, and then use your readaloud and guided reading books to address that topic. Plan to teach the most important skills right at the beginning of the day. Students are most focused at this time and are more likely to retain what you teach. At the beginning of the year, I go over the letters and sounds right after our morning meeting. Alternate activities that involve sitting quietly/listening with activities that involve movement. For example, you might teach a minilesson, have students work in centers, and then read a book aloud. If you must have two “sitting and listening” activities back-to-back, make sure to include a movement break in between them. Remember that you don’t have to do every activity in the same way every day. You may not have time to meet with 3 guided reading groups every single day, even if you teach full day Kindergarten. You don’t have to plan for a shorter guided reading block for the entire week – just meet with 2 groups some days and 3 groups other days. Or, if you don’t have time for a full writing workshop every day, make your minilesson super short some days and give students time to write. Begin and end the day as a group. It builds community for students to come together for morning meeting or an end of the day song/routine. Those are my favorite times of the day for sure! I hope this post gave you some ideas for structuring your balanced literacy block! 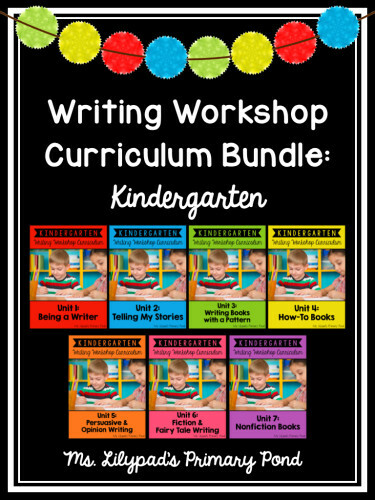 If you are looking for reading and writing curriculum for Kindergarten, click on the images below to read more. Do you have any other strategies or suggestions? Please comment below! Thank you so much for your ideas with half day Kindergarten! I teach two sessions of half day Kindergarten and some days it feels impossible to fit everything in. So thank you for not only acknowledging that it still exists, but also giving ideas of how to schedule it all! Thank you for all of the schedule suggestions! I would definitely use one if I had a self-contained class, but our school is departmentalized so it limits the time we have. I teach ELA to 2 classes for 1 hour, 4 days/wk. in which 30 minutes of that is for our phonics/handwriting program. We also have to work around our specials time (50 minutes) and lunch/recess (1 hour). Having your own class gives you more freedom to do your own schedule. Wow, you all are departmentalized in Kindergarten?! That sounds hectic! I taught a 1st/2nd grade class that was sort of departmentalized, and it was really challenging. When I just needed 10 extra minutes for the kids to finish something up, I couldn’t have it because they had to switch classes. I missed having my own class like I did in Kindergarten. I hope the schedule ideas were still at least a little helpful! 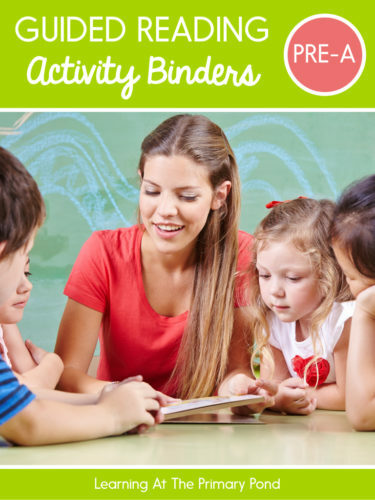 Thanks for linking up to Great Blog Posts for Kindergarten Teachers. What about recess, and traditional centers (dramatic play, blocks, etc.)? Even in our half day K we have continued to place importance to children’s social, emotional and physical development. We need to advocate for our youngest learners. I absolutely agree, Janet! I included recess and free choice play when I taught full day Kinder. In the district where I teach now, however, these are not included in the half-day program. I know that many other half-day programs also have omitted these components since half-day is so brief. It’s a tough thing, but I would love to see districts place more of an emphasis on these needs! You’re so welcome, Lindsay! I think you will love full day! It’s less rushed and you have more time for things like projects and play. Have a great start to the school year! Are your literacy stations different from your free play stations and do you have math ststions? Hi Jenny! They are different from my free play stations. The kids do literacy stations during the literacy block and then free play at the end of the day (although there are certainly literacy activities integrated into the free play). I have also done math centers, too, after a math mini-lesson. I have seen many sites list mini lessons for reading/ writing. Could you please guide me towards what a mini lesson looks like? I have been unable to find lessons that are under 20 minutes and I know if I could see an example I would be able to create better plans. Please help. I was wondering how you fit any play into your day? We try to have a play-based program and fitting everything into a balanced day can be difficult. Does anyone else have a play-based or enquirey based schedule that work well for a JK/Sk split? Hi Allison, thank you so much for sharing your great ideas. I just happen to find your blog on Pinterest when I was searching got decoding activities. I find myself struggling with time because I want to fit in phonics and guided writing within each guided reading rotations. This schedule helps. Can I ask besides a-z books what other grade level books would you recommend for like an independent reading center? Thanks again ?. Hi Marja! I have used lots of different types of books for independent reading – from BookSource.com (they have leveled collections), Scholastic (also has leveled collections), Rigby Readers are great, and then I just use leveled book lists to find appropriate texts (here’s an example of one: http://www.public.asu.edu/~diann/Bibliographies/leveledbooks.htm). I hope that helps a bit! Thanks for reading and commenting! This is great information. Thanks for creating such a wonderful blog!! Thank you so much for posting this. I taught kindergarten for 14 years and had to stop for a while. I am ready to go back to teaching kindergarten again and your post helped me remember what I thought I had forgotten. Thank you for the schedules! That is the hardest part for me right now! I very much believe it is important for children to play everyday. How long did it take for them to pick up their free choice centers before it was time to exit the classroom for dismissal? Scheduling a closing circle (10 minutes?) plus clean up (5 minutes) leaves me with 20 minutes of free play. In reality is this about what Schedule A would look like at the end of the day? Hi Jeanne! I don’t remember the exact number of minutes – I would say maybe 5 for choosing centers? If you try it out, I hope it goes well! 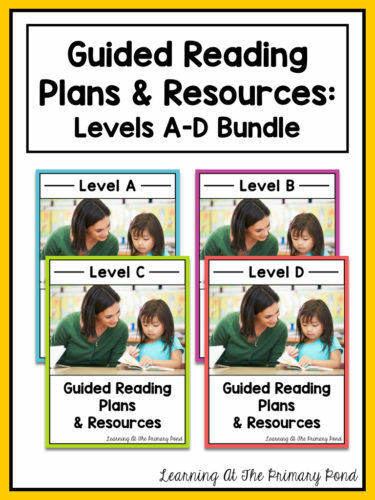 Do you think the Reading components in Grades K-3 should be taught in a certain order? Our county has started a program and it suggest to do Read Aloud first then lead into Shared, then Guided, and last Independent. Writing does have a set time, but can be at teacher’s choice. Phonics is suggested during transitions, too. I REALLY like your schedule and want to get your opinion/advice when have time. When students are independently reading, practicing the skill you taught, are you all reading the same book or free choice? Thanks! Hey Megan! It’s free choice – although sometimes I may ask them to choose a nonfiction book (for example) if I’d like them to practice something specific. Do you phase in the 20 minutes of independent reading? If so, when do you start (i.e. week 1?) and for how many minutes at the beginning? Hi Caryn, definitely! We literally start with about 3 minutes at the very beginning. 🙂 Maybe 5, if they’re doing well! We then work our way up, with me adding 1 minute at a time. We can also split the time up into two different sections during the day. We start that Week 2 – but I have them looking at books from Day 1, just a bit less formally. what do you teach during the reading lessons? Children between4 and 6 are aloud to read what ? Do you have the students rotating in centers during that time? Do you have guided reading be a “center” they do with you as one of the rotations? Do you have the kids move to different centers on their own and you call up guided reading groups out of centers? I’ve been doing the rotations and Guided Reading is one of their rotations, but then that only gives me 10 minutes for each group. I teach half day K from 9:15-12. Do you fit in a recess ever? When I taught half-day K, we only occasionally had recess. Kind of a bummer because I feel it’s so important for them to play and have socializing time, but we tried to create opportunities for play-based learning within the day! Thank you! Before teaching Kindergarten I taught grade 1-3 over the span of 10 years which was before my 8 year break to have babies. I would pull kids from centers for GR as well. I think next year I’ll be trying that with my Kinder-kids. Then the center groups can more diverse than the kids always being with basically the same kids all year. Looking forward to your post on centers! Thanks again for all your suggestions, ideas, freebies and amazing bundles and such! I’ve learned a lot the last few months! Thank you so much for this detailed post! I stumbled upon your blog through Pinterest and I am so glad that I did. This is my first year teaching kindergarten and I am just trying to figure it all out. Your schedule is particularly helpful. 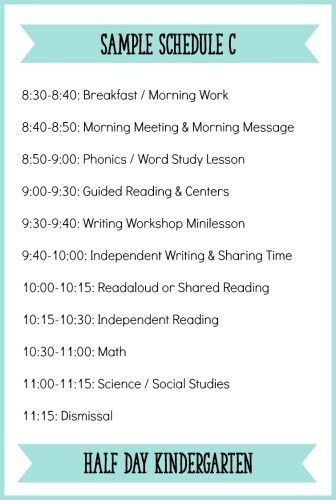 I love the variety of activities you put in that target all components of literacy and I think this will really help me in creating a balanced schedule for the full day. I am looking forward to browsing around and reading more of your posts! Hey Carla! I’m so glad this is helpful and the schedules gave you some ideas! I’m excited for you to start Kinder – it’s my favorite grade. Thanks for reading and leaving me a comment! The best kindergarten schedule in my opinion! Thanks so much for sharing this! This is really going to help plan my instructional time this year! Thank you soooo much. This has been very helpful. Love your schedule and your blog. My question is, how do you address the needs of your struggling students? If 1-5 of children are dyslexic, guided reading is not going to work. They need the 45 minutes of phonics and the 10 minutes of guided reading. I wondering how as teachers we can “do-it all?” Thanks for the feed back. 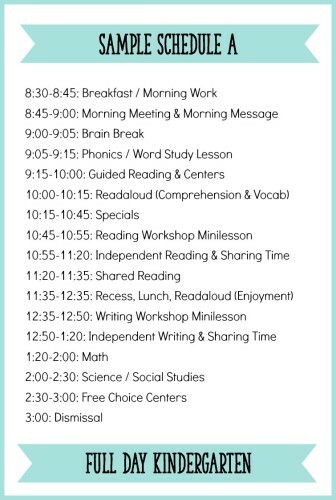 This looks more like a typical first grade than a kindergarten schedule. Have you looked at various guidelines for implementing good practice in kindergarten? I would love to see how you would take that long block of time and integrate it across curriculum areas. I do see there are literacy centers but wouldn’t it be better if the work in the literacy block included social studies, science, art, and other areas? Hey Nora! Some of the literacy block work absolutely does integrate SS, science, art, etc. (centers, specifically, as well as readalouds and other components). I have also taught in a bilingual classroom where I had a separate SS/science time because that was the English integration portion of my day. All of this is just a starting point and is definitely flexible! Thank you for this post; it will help me greatly next year. How do you incorporate sight words into this schedule?